What The Blue Shell Happened? 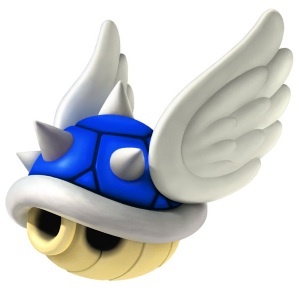 For years, Mario Kart's blue turtle shell has wrecked havoc and determined the outcome of races. Is this fair, or foul? When it comes to Mario Kart, the infamous blue shell is the most feared of power-ups, or the greatest, depending on one's perspective. For the person in last, it's a means to an end, a form of salvation and perhaps a measure of revenge. For the person in first, it's an annoyance, a bothersome object that only serves to ruin everything he or she achieved. Coming soon to a first place racer near you...with love. For Nintendo, it's a way to employ competitive balance, a way for the worst player to suddenly win the race, going from potential loser to winner in a matter of seconds. The whole thing has a certain NFL quality to it. Ah yes, parity. Personally, we think the blue shell's a bit on the cheap side. Yes, it's nice to know there are few guarantees when it comes to picking Mario Kart winners. Anything can and does happen. At the same time, it sort of undermines the effort someone puts into a race. You could be ahead for two and a half laps, when all of sudden the guy in sixth nails you with that shell and somehow becomes a legitimate threat. The person in first deserves to be there. The blue shell sullies this notion. Now, the person in first didn't necessarily earn that spot. He or she cheated to the top. Well, "cheated" is a relative term, since the shell is a legal weapon. And yes, it returns in Mario Kart 7, and yes, it still does a heck of a lot of damage. So what are your thoughts of the spiked blue menace? Essential? Cheap? Fun to use? Chime in and let us know.